Everyone knows that the weather can quickly turn nasty in the High Country. When Karen and I walked out from Charlotte Pass in the early afternoon, crystal sunshine cheered us along at first, warming up as we got into stride. I adjusted the pack-straps to get more comfortable, feeling good to be back ‘in harness’, even under my 35kg burden. “Too much camera gear … again.” We could hear the water down in the Snowy and in Club Lake Creek. On the other side, we could see strips and patches of snow on the slopes, mirroring the few chunky clouds above. The first big raindrops were a surprise, and we hurried into Goretex, but it soon became pellety hail, so we tramped on with our heads down to avoid the noisy projectiles. Met a few groups of walkers, all retreating down off the mountain. “There’s a couple of days of weather coming through”, one said. “You’d be better to hold off till Tuesday.” That wasn’t an option for us. We had an appointment on the summit of Mt Townsend: 1pm, Monday 19th of November, 2012. Once up past Seaman’s Hut, we left the track in fog and followed a ridge down towards the creek below Mueller’s Peak. Not that we could see it. The hail had turned into heavy wet snow, blowing horizontally from the south, and our recently expansive world had collapsed down to a circle of just twenty metres around us. The big snowflakes muffled sound, and it was curiously quiet. We admired a few early white daisies and eyebrights, poking up through the snow grass, and wondered if they regretted their emergence so early in the season. We jumped across a little creek, strapped on snow shoes and spiked our way up the crusty snow on the other side. On reaching the pass above Wilkinsons Creek, we were now walking the same route as was taken by Von Guérard’s party of five – 54,786 days before us. We descended from the pass down towards Wilkinsons Creek, and by the time we found a suitable flat grassy campsite, the snow had stopped and the sun was out again. We put up the tent, and cooked some soup, and noodles with venison jerky. We drank tea while the sun set behind Abbott’s Peak, and the meanders and oxbows of the creek turned to shiny gold below us. It was getting cold. I took a few hurried photos, and we retreated into the tent. A dense fog descended with the dark, and windy rain fell through the night and into the morning. Breakfast in bed. Read, and drank more tea. The fog and rain-clouds began to break up around 11 o’clock, so we emerged, loaded up our daypacks and headed across the snow and up the slope to Mt Townsend. Just two hours to make our rendezvous. Happy 200th birthday, Eugene. Along with all the camping and photographic gear in my backpack, the food, clothing and emergency kit, I carried my own history. In 1835, my great-grandfather William Rial was a convict assigned to a station at the northern end of Namadgi – at Tuggeranong and then later at Lanyon. Over the years I’ve fantasised (without the slightest evidence) that he too might have travelled over the Monaro and ventured up into the Snowy Mountains, back when the Ngarigo people still went up there in summer to feast on the bogongs – and several decades before Von Guérard’s visit. Later, and from 1894 to 1942, his son (my grandfather, Archibald Rial) held leases to run stock up near Mt Jagungal – at Farm Ridge. Every year, from November to April, he and his stockmen would graze thousands of sheep (and some cattle) up there, returning down the western side with the first snows. Family legend is that he panned the gold for my grandmother’s wedding ring from the Doubtful River. 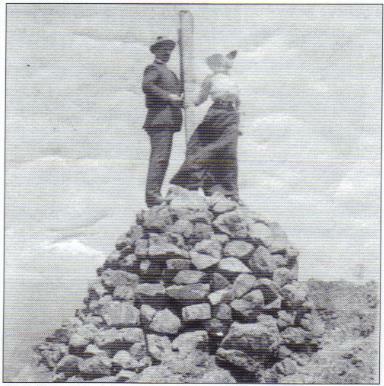 They climbed up Jagungal on their honeymoon in 1910. She later scandalised polite society as “the first woman to ride astride down the main street of Adaminaby”. That makes me feel strangely proud. Then my own immediate family farmed on the western side near Tumbarumba. Uncle Bill took me up trout fishing, and Uncle Ted took me skiing at Kiandra during September school holidays. With Aunty Thel he took me up the Tumut River so I could see and remember the prime farming land, before it was submerged by the new Blowering Dam. Nowadays I regularly travel down the Monaro Highway to hike, camp and make photographs in the mountains. By my rough estimate, my boots and snowshoes have made well over a million footprints on the land there. Perhaps then it’s unsurprising, but in ways that I enjoy but can’t fully explain, I feel connected to that country. Not in the sense of ownership, more like a kind of belonging, as if some part of me has chosen this place, of all possible places, to be a homeland of my identity. The land speaks to me, with stories of all the people, ancestors and strangers, who have left their traces on it. I keep some mental snapshots stored away (early morning mist alongside the Finns River near Tin Hut, sunset over Lake Albina from Muellers Peak), that I summon up when I need to find calm. I think (or at least I like to think) that the photographs I make there are an attempt to explore and express these feelings. 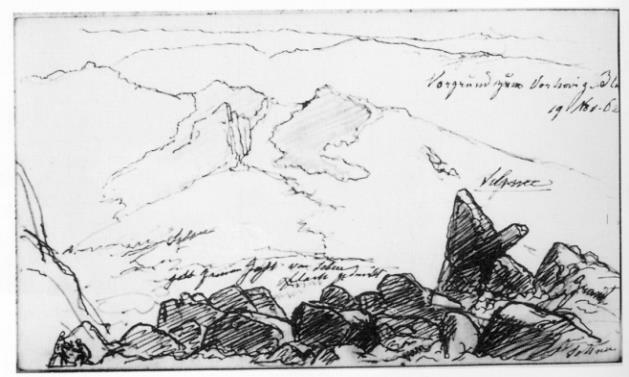 After he “seated himself on the summit”, Von Guérard made just two drawings in the little field sketchbook that he carried with him. The foreground sketch shows, at the lower left side, the outline of a craggy rock wall that would later become a major feature of his painting – even though no such dramatic jumble of boulders exists at the actual site. Then followed a tinted lithograph, with another staffage figure incorporated. 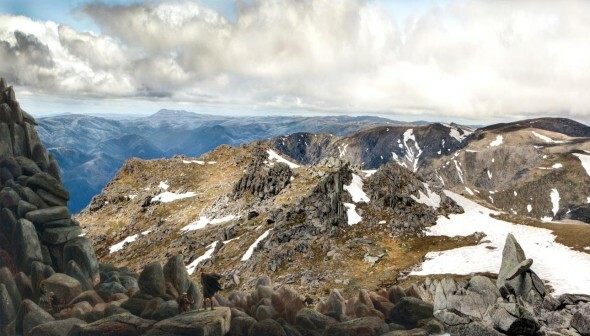 Finally he produced the oil painting, North-east view from the northern top of Mt Kosciusko (1863), with the figures smaller, and moved slightly towards the right. In many ways, the painting reflects a mid-19th century, rather ‘European’ way of seeing the Australian landscape. Von Guérard learnt his craft in Austria, Italy and Germany before coming to Australia in 1852 and, like other artists of the time, often employed a palette more suited to the quality of light, the forms and the traditions of Europe. Structurally, he sought an almost scientific verisimilitude in his landscapes. He was inspired by Humboldt’s empiricism, his conception of the complementarity of science and art, and of the importance of precision in recording the world. At the same time, he also sought to imbue the landscape with an aura of sublime grandeur, which was the general taste of the time. It shows in the dramatic boulder formations that he added to the left foreground (‘rock and awe’? ), and in the way that the staffage accentuates the impressive scale of the natural landscape – and the insignificance of humans within it. It’s a beautiful painting, but there’s a contradiction at its heart: the scientific and sublime are in conflict. For example I found, when manipulating my photographs in Photoshop to match his painting, that I had to stretch the vertical scale by more than 20% to align it with the more alpine (and ‘Alp-like’) peaks of his representation. Precise topographical accuracy sits alongside fanciful topography. The fantasy boulder-pile frames the landscape, but is as exaggerated as the mountains of a Gothic altarpiece. The painting has always appealed to me, since I first saw it 30 years ago. I like it that it is a scene from ‘my country’, and that it is both immediately recognisable but also ‘not quite right’ – a sublime falsification of the place depicted. I enjoy the danger and adventure in the story of the Von Neumayer expedition. And, like most people who view and admire it, I respond (or am susceptible?) 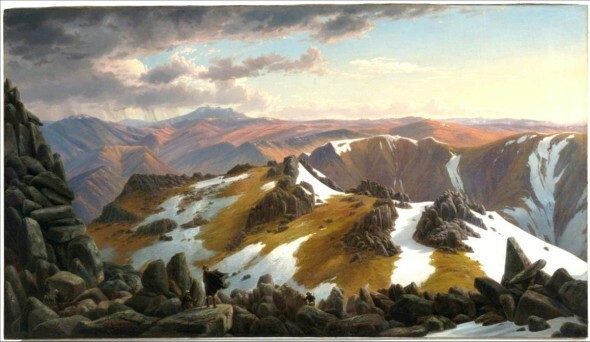 to all the conventions and techniques of the landscape art tradition that the painting embodies: the grandeur, the dramatic light and weather, repoussoir, layers of landscape before a bright horizon, human scale, ridge lines to lead the eye through the frame. 1pm, right on time. We had to leave our snowshoes and poles just below the summit, and clambered over and around the granite tors, hands and feet working together, to reach it. The sky was gradually clearing, but it was cold and a little windy. By lining up the triangular rock in the bottom right of Von Guérard’s painting with the slope of the ridge behind it, we could identify the smooth flat boulder that he sat on to make his drawings. It would have provided him with some shelter from the wind. We compared the scene with a printed copy of the painting to confirm. “Yep. It has to be this rock.” We stared respectfully at that ordinary bare stone, now transformed into hallowed ground for us, and tried to conjure up an image of the artist perched on it 150 years ago, drawing into his little sketchbook. Looking out, we realised that his picture only captured a small portion of the panoramic view from the summit (less than 45o, or a one-eighth segment). We marvelled at the patterns of late spring snow which, although less extensive, closely coincided with those from 1862. Figure 6 – John Boyd Macdonald. Untitled, (2012). Digital image. “OK, time to get ‘into the zone’.” Tripod erected, camera mounted, 24-70 f2.8L lens, mirror locked up, remote shutter release, ISO 100, F14, 1/60 second, framed … shoot. Under- and over-exposures for possible later HDR composite image … shoot. Panorama series to stitch later. Shoot, shoot, shoot. The light’s changed, do it all again. 69 exposures in all, but in my mind I’d already taken them and seen them a thousand times before. For an all-too-short while I was fully absorbed in the process of it, feeling the enjoyment of purposeful image-making. Just time for some quick lunch and a sesame bar, then we packed up and prepared to gingerly descend the ice, rock and snow from the summit. Clouds were coming in from the western side. It was 2:25pm, so it was time to go. For years, my photography usually happened as an adjunct to doing something else. It was normally associated with some kind of ‘occasion’ – going somewhere distant or exotic or picturesque, attending an ‘event’, or a meeting with friends and family that I didn’t see regularly. I’d take the camera along, and make photographs to record the incident, the place, the people’s faces, or some serendipitously found thing that appealed to me. In other words, I would mostly make snapshots (what a precisely evocative word! ), shot in a snap, as a record, a consequence or derivative, of another activity. I don’t know when the change came ­– and I think now that it was a gradual thing – but in time I found myself only wanting to make pictures when I thought they had potential visual merit – though I often couldn’t have articulated just what it was about the particular frame that appealed to me. I left others to be responsible for creating the documentary record; I was coming to value the images more than the subjects. Often, due to flat light or flat mood, with the result that I’d carry my camera all day and never even unleash it from its case. But other times, if the light, subject, or my own mood (and especially the mood…) engaged me – for whatever reason – I’d shoot off a roll of film (or later, a memory card) in a very short time. I came to realise that what I was really enjoying, as much as the intermittently successful photographic outcome, was the feeling of immersion in the process of picture-making, of becoming absorbed (losing myself?) in the physical and mental act of photography. Seeing, conceiving, composing, making technical decisions, and coaxing the camera to see the frame in the same way as my mind’s eye. Imagination, judgment and body memory all working together. It’s still always a special feeling to find myself moving (sometimes stumbling) ‘into the zone’. I still ‘take snapshots’ and document the (trivial and profound) incidents of life with the camera, but more often it’s a process of ‘purposeful image-making’. I like to set out for the purpose of photography, with some specific images in mind (though never anything as prescriptive as a ‘shot-list’), rather than having the camera accompany me while I’m doing something else. The ‘something else’ still happens, and all sorts of incidents and issues arise along the way, but this ‘stuff happens’ as a by-product or side-effect of the photography, and not the other way around. I like this approach, and the reversal of my earlier practice. Not only does it usually result in better images, and images that are collected like ingredients for a specific post-processing recipe – but there’s something fundamentally satisfying about setting and achieving a goal. We left Von Guérard and his party to their storm. Our trails diverged as we came down off the mountain, and we descended in sunshine to our sheltered campsite by the Wilkinson Creek. They went on through the storm to their own campsite on the Ramshead Range. In fact they were fortunate to survive, but their expedition did eventually regroup and carry on after this “annoying affair”, although poor Edward didn’t turn up till some 18 days later. We suffered from no such ‘annoying affairs’. We returned from Townsend to our campsite in glorious weather, enjoying the rapid descent, plunging down snow patches as if wearing seven-league boots. We wandered downstream along the Wilkinson River, counting mountain galaxias in the icy water. A mild night, and the clear warm weather continued until late on the following day when we returned, through spectacular scenery via the Blue Lake, to our starting point at Charlotte Pass. I returned home with 293 raw image files – for me a relatively small number for a three-day walk – loaded them to Bridge and flipped through them quickly, to find out to what extent reality matched my intentions. As usual the process was initially disappointing, even depressing, and once again the familiar self-doubt rose up to the surface. Once again I had fallen into the yawning gulf between what my eye (and mind) had seen in the viewfinder and what the camera sensor recorded. I should know by now. Most often it’s about light intensity, the much wider dynamic range that the eye can distinguish and record compared with the digital camera sensor. So what I had imagined would be a killer shot appeared instead to be D.O.A. ; what I saw as a dramatically lit scene ended up with blown-out whites, and blacks without detail; soft moody glowing light ended up looking merely flat. But (I told myself) that’s what post-processing is for, that’s why I take the same picture multiple times with slightly different camera settings – and anyway all I needed was one good image to reconstruct the Von Guérard picture. In early 2012, for a university assignment, I researched Imants Tillers’ Mt Analogue (1985), which is a large-scale appropriation and re-purposing of Von Guérard’s painting, comprised of a grid of 165 small painted canvasses. I also came across Dacre Smyth’s work from 1984, painting some 50 views from Von Guérard’s landscapes across Victoria. 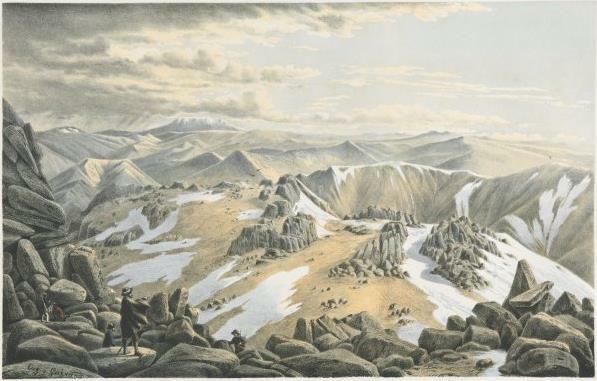 In the course of the research, I noticed the date of Von Guérard’s visit to Mt Townsend: 19th November 1862 – also the date of the artist’s 50th birthday. Seeing this, and inspired by Tillers and Smyth, I resolved to create my own reworking of the image, on the date and time of the 150th anniversary. I spoke to a number of people about the project, including Tillers himself, and everyone seemed to like the concept. I know that “150 is just a number”, but it seemed somehow auspicious, somehow ‘right’ for me to do it. And it made a good basis for some purposeful image-making. From the start, I knew that the image I created would be a hybrid, with the invented elements of Von Guérard’s painting overlaid on the photograph. This would make the reference to the painting explicit, and would disrupt any reading of it as a pure landscape image. I also decided that the photograph must have the same proportions as the painting (i.e. a height to width ratio of 1:1.756), which meant that I would have to adjust the vertical scale of my photograph to match Von Guérard’s exaggerated scale. I didn’t want to simply recreate his picture, with my pixels in place of his careful brushstrokes. So much has changed in the 150 years since he was sketching on Townsend: not just the physical landscape itself (though this may be less obvious in such a ‘wilderness’ location), but also the cultural landscape, the climate, attitudes to the natural world, and the relationship that we have to visual images more generally. The changes in language reveal the gulf between Von Guérard’s world and mine. His painting is (inevitably) written and described in the language of his time: in such words as ‘magnificence’, ‘sublimity’, ‘discovery’, ‘grandeur’, ‘European’, ‘expedition’, ‘exploration’, ‘picturesque’. I hoped that my re-construction of Von Guérard’s image would also allow for some re-visioning; that it might allude to or reflect on some of these issues of nature and culture, in the sesquicentennial year. 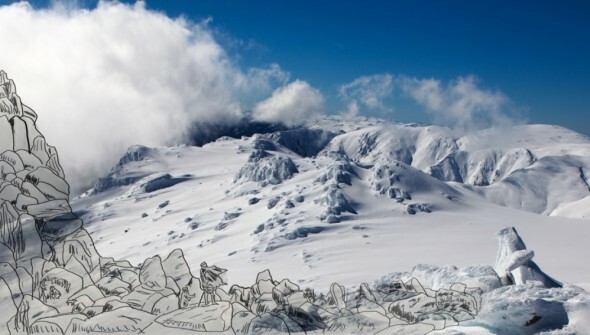 In mid-winter of 2012, (19 July, or 149 years and 8 months after Von Guérard), I snow-shoed up to Mt Townsend from Crackenback as a ‘reconnaissance’ exercise. A perfect still day, after 20cm of snow had fallen during the previous night. My tracks were the only marks across the fresh snow of the Main Range. Back home, I experimented with putting overlays onto the photographs I had made, outlines of Von Guérard’s invented rockpiles, tracings of his drawings and text from Von Neumayer’s expedition journal. Figure 7 – John Boyd Macdonald. Mt Townsend, 19 November 1862, (2012). Digital image. Figure 8 – John Boyd Macdonald. Mt Townsend, 19 August 2012, (2012). Digital image. I was pleased with the results from this exercise, especially when I had some of them made up as large prints, and I was encouraged by feedback from people who saw them. I looked forward to returning in November for the ‘anniversary’. Von Guérard’s workflow towards his painting went from partial sketches to a consolidated sketch to a hand-coloured lithograph to oil painting on canvas. My own process, although aiming to produce an object which visually resembles his, could hardly have been more different. From the 69 RAW images I made, I took five identically framed shots that spanned over five stops of exposure (from -2 to +2). I merged these into a single TIFF file using the exposure fusion method in Photomatix Pro. I opened this file in Adobe Capture Raw, where I removed some sensor dust spots from the sky, corrected some minor chromatic aberrations towards the corners of the image, lightened and slightly desaturated the blues from the sky, pushed up vibrance and expanded the contrast, trying to produce a histogram that approximated that of the painting. Opening the file then in Photoshop, I cropped the image to match the scene coverage of the painting, then re-sized the image to stretch the vertical scale up to create the desired aspect ratio (producing an image of 4083 x 2035 pixels). I used dodge and burn tools to both darken and lighten clouds, and to highlight the brightness of certain grassy slopes in the middle distance. In a separate file I masked the foreground rocks and figures from a good quality reproduction of the painting. I overlaid this onto my photographic image, resizing the new layer to be proportionate with the lower layer, and cleaning up the edges in places. I created adjustment layers for exposure curves and colour balance, applied some local healing brush fixes, some slight overall smart sharpening, then … Save. Project completed. Figure 9 – John Boyd Macdonald. Mt Townsend, 19 November 2012, (2013). Digital image. Von Guérard believed (incorrectly) that his party were “the first men who have ever trodden” on Mt Townsend. He was stimulated by the thought of ‘discovery’, by the Humboldtian project to record, measure and analyse the world through his art. We, on the other hand, took well-trodden paths into the ‘wilderness’, guided by GPS, recorded by digital cameras, connected by mobile phone and protected by EPIRBs. To us, Humboldt’s mission appears to be near completion, and ours looks like an exploration of nostalgia. Two months after our hike to Mt Townsend, Karen and I travelled across Victoria, camping, hiking, and visiting regional galleries along the way. Along the way, we found ourselves compelled to join up again with Von Guérard – in the Grampians (Mt Abrupt, Rouse Hill), Warrnambool (Tower Hill), in the Dandenong Ranges and Gippsland. And we also met up with Chevalier at Mt Arapiles, and with Nolan in Dimboola. It seems that this exploratory nostalgia may still have further to go. Georg Von Neumayer, Results of the Magnetic Survey of the Colony of Victoria Executed During the Years 1858-1864 (Mannheim: J, Schneider, 1869), 77. Although von Neumeyer had stated it to be Von Guérard’s 50th birthday, it appears to have actually been his 51st – in which case our visit coincided with the 201st anniversary of his birth..
 Blossom Macdonald, “Honeymoon at Farm Ridge,” Kosciuszko Huts Association Newsletter, no. 147 (Autumn 2010). Von Neumayer, Results of the Magnetic Survey of the Colony of Victoria Executed During the Years 1858-1864: 77. Reproduced in: Alan J. Andrews, Kosciusko: the Mountain in History (Canberra: Tabletop Press, 1991), 160. Ruth Pullin, “Eugene von Guérard: art, science and nature,” in Eugene Von Guérard: Nature Revealed, ed. Ruth Pullin (Melbourne: National Gallery of Victoria, 2011). Von Neumayer, Results of the Magnetic Survey of the Colony of Victoria Executed During the Years 1858-1864: 77, 78. Retreating back to camp from the summit as the storm hit, the party first lost Neumayer’s assistant Edward Brinkmann, along with Hector the dog, then Weston (guide No.1) and John Twynham (guide No.2). Hector found his own way back, Twynham was found in a hypothermic state and carried back to camp, and Weston returned about midnight, having seen light from their campfire. Brinkmann was eventually reunited with the group at Wodonga, 18 days (and 300 miles) later, after finding his way there via the Kiandra goldfields. Von Neumayer, Results of the Magnetic Survey of the Colony of Victoria Executed During the Years 1858-1864: 85. Dacre Smyth, Views of Victoria in the steps of von Guerard : a fifth book of paintings, poetry and prose (Melbourne: D. Smyth, 1984). Malcolm Andrews, Landscape and Western Art (Oxford: Oxford University Press, 1999), 222-3. Quoted in: Tim Bonyhady, “The Tipping Point,” in Eugene Von Guérard: Nature Revealed, ed. Ruth Pullin (Melbourne: National Gallery of Victoria, 2011), 38. 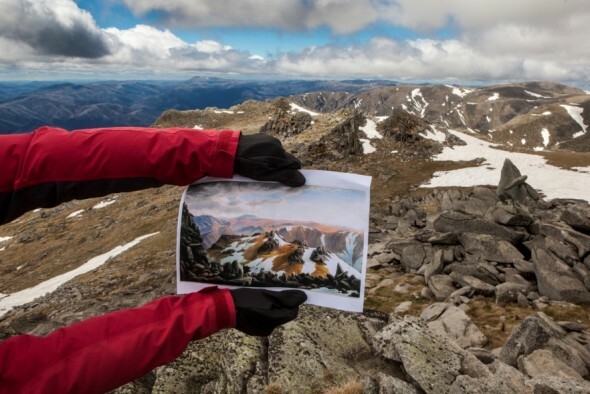 This entry was posted in General, Text in photography and tagged Eugene Von Guerard, Georg Von Neumayer, Mt Townsend, North-east view from the top of Mount Kosciusko. Bookmark the permalink. Hi there, great blog – I will have to read this properly to absorb it all. You might like to know that I have been on a vG crusade myself and in fact I invite you to come to Alexandra Victoria over the next five weeks to view an exhibition called “von Guerard Inspired Art Exhibition ~ Acheron Valley and Surrounds’ celebrating vG and his expedition to my Shire (Murrindindi). We’ve been having lectures by Dr ruth Pullin and going on sketch site escapades up and down hills. Not so wonderful as your photography and your adventure, but fabulous for those of us who love the environment and being outdoors and linking with the historical record that Eugene so beautifully left us all. You might be traveling by perhaps…drop in to Alexandra’s little shop called Rustic Simplicity and view the inspired artworks. There’ll be mark 2 in two years from now. Best wishes and thanks for the blog. Terrific.